Ready to give therapy a try? I founded and own Dr. Allison and Associates, a group practice in the western suburbs of Chicago, specializing in individual therapy. My team is comprised of gifted and compassionate therapists, ready to work with you one on one. Our clinicians are in-network with Blue Cross Blue Shield, and we are considered out of network for all other insurance providers. We want to be in the room with you, so at this time, we do not see clients through Skype, Facetime, or other distance platforms. Ready to connect? 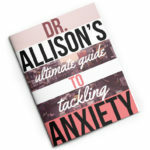 To get started, reach out at drallison@drallisonanswers.com or (630) 441-4415. Once you are scheduled, please download, print, and complete the following forms. Bring them in to your first appointment. If you prefer to complete these forms at the time of your first appointment, please arrive 15 minutes early. For my office location, click here.